Over the years, I’ve read things by people who have left the church but continue to identify as Christians. There are a variety of things that lead to such a decision. Some have had bad experiences in the church and are connecting with God elsewhere. Others are reacting to a navel-gazing form of Christianity that neglects the world outside the church. Sometimes people are unable to minister in the way they feel called within denominational structures so they pack up. Recently, I read the comments of a man who talked about his negative experiences in church. An ever growing burden of expectations and commitments left a sour taste in his mouth. He decided to leave the church. Now he says he finds God in coffee shops, teaching guitar lessons, and watching the sun rise. I get it. There are reasons to be dissatisfied with church. Our attempts to live out the gospel are halting much of the time. (By the way, people who leave the church also fall short when living out the gospel. Just sayin’). Churches struggle with legalism, institutionalism, liberalism, unbelief, divisions, and politicizing their faith. Christians mistreat each other all the time. As GK Chesterton observed in his book Orthodoxy, original sin is the most provable part of Christianity. The question isn’t whether Christians and the church will fail, the question is, How do we respond to that failure? When answering any question about faith, we are probably least served when we start with our experiences, whether good or bad. A better starting place–the best, in fact–is Jesus. Jesus came to God’s people but wasn’t received by them (John 1:11). He was accused of everything from drunkenness to blasphemy by the religious leaders of that time. His disciples weren’t all that great either. They bickered, doubted, stole the tithes, and were influenced by the devil. If Jesus took His cues from our experience, this is where He’d leave the church and start a blog about finding God elsewhere. But His ways are not our ways. Jesus didn’t leave God’s people. He attended synagogoue regularly, engaged the Pharisees, and tirelessly instructed His disciples. He fed the 5000, healed the sick, and went toe to toe with the devil wherever He found him. Even when God’s people put Jesus out of the camp in disgrace He gave Himself as the offering for their sins (Heb. 13:12). And this was just during the 30ish years He walked the earth. Think of the centuries He put up with Israel or the centuries He’s stayed with the church. Enough said. If anyone has grounds for a grievance against the church, it’s Jesus. He is flawless in every motive, pure in every action. His perfect response to an imperfect people was to give up His life. The rest of us are just self-righteous fakers throwing stones. The Lord hates divorce, and so should we (Mal. 2:16). Sure, there are real reasons to leave a church. God may call us somewhere else. We may be in a spiritually abusive situation where leaving is necessary. Our convictions may change; going to a different church may be a matter of conscience or doctrine. Whatever our reasons, Christ’s selflessness is the test of them. And whatever reason we leave a church is no reason to leave the church altogether. 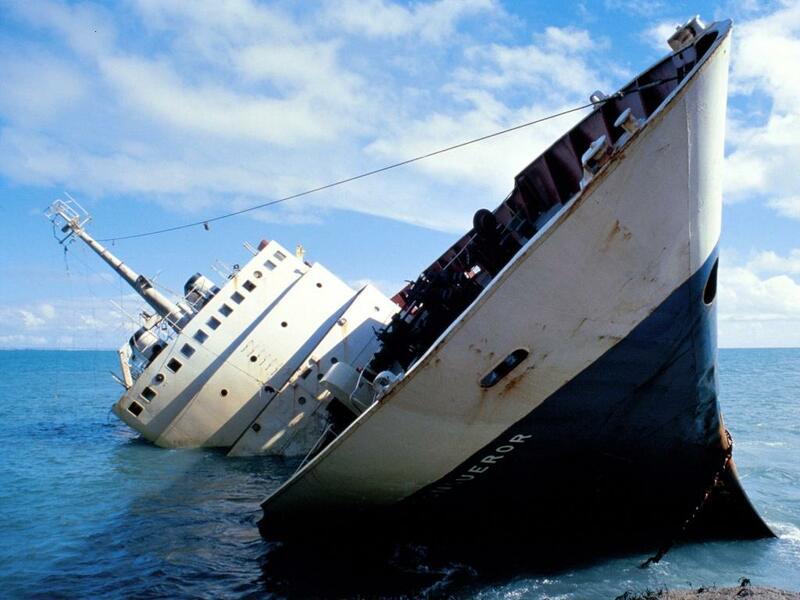 If the church is a sinking ship we have to ask where Jesus, the Captain of our Salvation, is. Like any good captain, He’s going down with the ship. If we bail on the ship we bail on our Captain. We also bail on others who need what we draw from Christ. If we stick with our Captain and the ship does go down, it won’t stay down. Jesus always raises from the dead. And since He won’t divorce us under any circumstance we’ll raise with Him. “And remember I am with you always, to the end of the age” (Matt. 28:20). Thanks, Matt. I appreciate you reading & commenting! ” Jesus always raises from the dead. And since He won’t divorce us under any circumstance we’ll raise with Him.” – So good! Thanks for sharing! Usually love your articles Teague but have to disagree with the main thrust of this one. Some people are called out of the institutional church system. I am one of them. I know many others. That doesn’t mean we are not part of the church. The church is a people, the Body of Christ. I can no more leave the church than I can cut myself off the Body of Christ. I agree there are people who take themselves out of traditional local assemblies for the wrong reasons. Please don’t lump all of us in that basket though. Some of us no longer attend the local church building because we fellowship together in houses, coffee shops, at the beach or in some other way. Yes, even on the internet. We have not ‘left’ church. We are the church just as much as those who choose to find fellowship in traditional settings. And we are not all bitter and angry. I love my fellow believers who attend church in traditional settings, but some of us are called to a different way of being church and a different way of fellowship. And I’m not sure how the verse from Malachi 2:16 fits in? (By the way, it’s ‘the putting away of the wife’ that God hates, which was translated ‘divorce’ by English translators because they had no equivalent to the Jewish custom where a man discarded his wife for trivial reasons and left her destitute). Are you saying believers who cease attending traditional church settings are divorcing God, or divorcing other believers? Thanks for your comments, Cheryl 🙂 I agree the church is people, & that is the sense in which I use it also. My intent was not to lump everyone together that leaves the church. That is why I start the post acknowledging some of the reasons people leave. In the second to last paragraph I give some other legitimate reasons people might leave a church. Of course, these don’t cover every reason. I am also using the word “church” broadly, not in reference to the institutional church. I realize people fellowship in many ways. As long as people fellowship in some way, I don’t have an issue with that. Most people wouldn’t call the churches I’ve attended traditional either. The verse from Malachi addressed the Levites who were divorcing God in that they were violating the (marriage) covenant with Him. Since Christ and the church are husband and wife, the verse seemed an apt image. Too often, I think we see church as just a building with people we see now & then, like a club. We don’t see the organic union we’re involved with. Since we don’t see church as it is we treat it casually. We just think of it as leaving a building when we need to think of it as leaving a marriage or as an amputation (using the body metaphor). My challenge is really for those who, like you said, stop fellowshipping for the wrong reasons. In all we do, Christ’s selflessness needs to challenge & judge our motives (especially when we consider no longer fellowshipping). Thankyou for your gracious reply. I have read the article again and do see that you are primarily talking of the church as a people and not the institutional church. I think there’s a problem, though, with the term ‘leaving the church’, and with statements like: “If Jesus took His cues from our experience, this is where He’d leave the church and start a blog about finding God elsewhere.” If we are truly in Christ, we cannot leave the church, so this is confusing the issue. Jesus did attend synagogue because He came to fulfil the law. He also taught that henceforth those who wished to worship God would worship in spirit and truth rather than a geographical location as under the Old Covenant. He taught in the synagogues, He taught in the Temple and He taught out in the wilderness and on the beach. I agree with you that we need to be sharing what we draw from Christ with others in His Body, whatever the setting. He is in the midst of His Body wherever two or three are gathered in His name. As a side note, my understanding of the passage in Malachi is that God was addressing the Levites concerning their violating of the marriage covenant, as you say. What they were doing and condoning was the Jewish custom of ‘putting away’ a wife for whatever reason she may displease the husband and so a husband could take another one. The man would send the woman away with no legal divorce certificate. This was called ‘putting away’. A woman in this situation could not remarry as she was not a widow, could not provide for herself or her children (except through prostitution) and was left destitute. The Hebrew word shalach is only translated ‘divorce’ in this Malachi passage. Shalach is translated “send’ 566 times, “send or put forth” 54 times, “send away” 48, along with many other similar meanings, but shalach becomes divorce only in modern translations and only in this one scripture. It is this cruel abusive treatment of the marriage partner, or the custom of ‘putting away’ a woman that God hated. You may remember even Joseph considered whether he should quietly ‘put away’ Mary secretly. I don’t see any reference to divorcing God in this passage. I am not condoning divorce but pointing out that the verse in Malachi and Jesus words concerning divorce are not about divorce as we understand it in modern Western culture. No Jesus won’t divorce us or put us away, but I do think comparing leaving a building, or a denomination for another setting to violating our marriage covenant with Jesus puts condemnation on a lot of people who need healing. Yes, I agree there are those who flit about all over the place and go when they need to stay though a situation. There are far, far more who are seeking other forms of fellowship other than traditional church settings due to repeated and other kinds of abuse. And sometimes their healing comes from drawing aside with God for a while as the only fellowship available to them may be destructive fellowship. My concern is for them as they read your post. As always, thankyou for the interesting and respectful dialogue. Rich blessings to you and your blogging ministry.